These Disney-inspired Paintings show Exactly what’s Wrong with our Culture. Every single aspect of Jeff Gillette’s new show “Total Dismay” at L.A.’s Gregorio Escalante Gallery comments on the waste and excess of our consumer culture. Both an installation piece and a body of artwork, the gallery show is a mixture of sculptures, shadow boxes, drawings, and small to large-scale oil paintings, most of which depict “slum-scapes” based on impoverished regions in India—and speckled with decayed Disney iconography that actually adds to the desolation. In “Bandra Mickey Brown,” a landscape of a small slum village devoid of people, has just one inhabitant: Mickey Mouse, as what may either be a doll left behind by a child, or the actual character, himself, eerily oblivious to the decidedly un-Disney world around him. 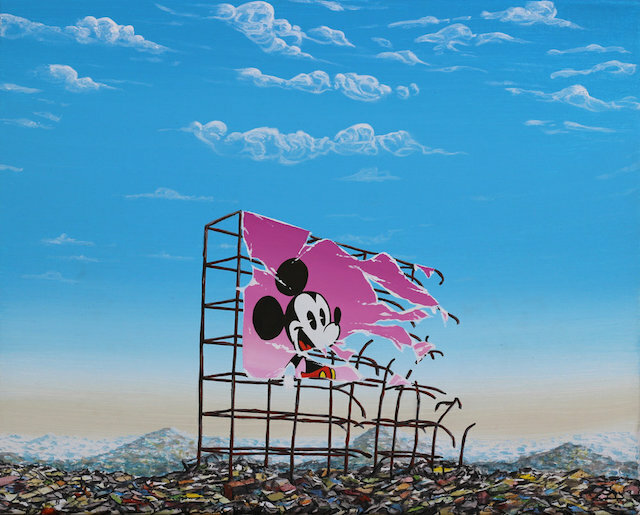 In a series of pieces called “New Mickey Landfill Billboard,” the iconic mouse smiles from a dilapidated billboard overlooking a landscape full of human wreckage. Was the billboard erected to somehow bring light and hope to the region, or is it perhaps remnants of the corporate forces that destroyed this civilization? The corporate symbols in these works, in many ways, represent the same things they do in real life: beacons of joy to distract us from our decaying world, imperial flags to indicate who is really in charge, and undoubtedly, the very creators of all the waste and garbage that has overrun the landscapes. 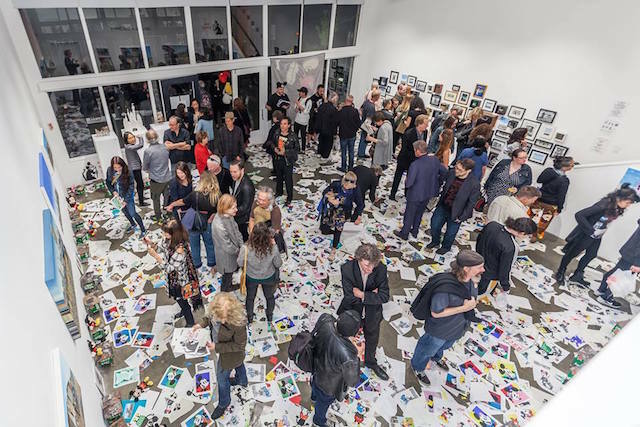 The entire floor of Gregorio Escalante Gallery is littered with hundreds and hundreds of originals and prints of Jeff Gillette’s earliest artwork. What once embodied the cutting-edge of his craft and inspiration has, years later, been reduced to the equivalent of bargain-bin clearance items (you can purchase five of these trampled on prints for $20 cash). The parallels to a retail chain making room for next season’s merchandise are hard to avoid. Yet art, society tells us, is some rarefied commodity that is almost beyond priceless. To add another layer of commentary to that affair, many of the originals scattered across the concrete have been customized for free by his art students—intern-style labor that’s ubiquitous in our late-stage capitalist society. “What’s the difference between a piece of garbage or a piece of garbage that is so-called art or a piece of garbage that is so-called art with my signature on it?” Gillette asks. In the art world, there absolutely is, but now seems like the perfect time to break that down and really examine it. As more and more of the world grows to look like the slum-scapes of Jeff’s paintings each day, these questions go beyond the art world as well. How much pollution is generated to create and distribute the merchandise based on Disney’s billion-dollar franchises? (To be fair, the same should be asked of any company.) And as more and more of the planet is destroyed to manufacture this art on a mass-scale, how does that affect the value of the merchandise and the internet protocol that spawned it? 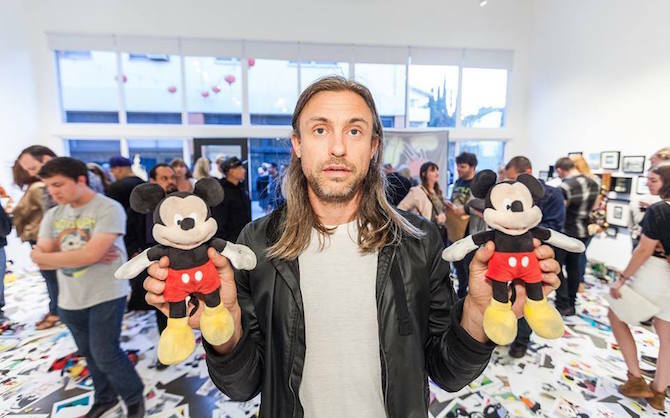 Can we still love Mickey Mouse if there’s literally an island of his discarded plastic action figures growing like a cancer in the Pacific Ocean? Gillette is the first to point out that he doesn’t hate Disney by any means. It’s just that the company’s symbols have aligned so well with the message he’s trying to convey in his work. “There are a lot of people who hate Disney. That’s what I’ve found,” he explains. “I don’t particularly hate them, I just like f*ckin’ with them.” And for all the foreseeable future, he plans to continue targeting them in his work. At the opening reception on May 27, one of the attendees, a long-time fan of Gillette, joked that the artist’s work was becoming prophetic. Hopefully, that’s not the case. But he might be onto something, though. Gillette’s work has certainly been propagated to the masses with a life of its own. “Total Dismay,” and the body of work Gillette created for it, is a direct sequel to “Dismayland,” the Disney-themed slum-scapes that first made him go viral. Those desolate creations attracted the attention of the world’s most famous street artist, Banksy, and in 2015, Gillette was invited to participate in “Dismaland”—a fully-immersive “bemusement park” installation. If the name sounds strikingly similar to Gillette’s “Dismayland,” you’re not the only one to notice—Gillette has been widely credited as Banksy’s muse for the theme park. Now, with “Total Dismay”, Gillette has brought the themes of both “Dismaland” and “Dismayland” further and more three-dimensionally into the world than he ever has before. The show might actually serve as a metaphor of his evolution into a brand as well: an artist of humble beginnings latching onto an idea that spreads like wildfire, leading to such a large body of work that the early commodities become over-saturated rubbish to be traipsed upon by consumers vying for a chance to buy the newest merchandise. Walt Disney himself would take notice of that career trajectory. If Gillette keeps this up, and society keeps on its current course, his next solo show might have to be held outdoors at an actual landfill in order to accurately reflect our world. Here’s hoping it can be at a recycling center, instead. “Total Dismay” will be on view at Gregorio Escalante Gallery until July 2. 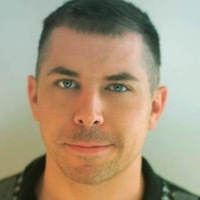 Dustin Clendenen is a Los Angeles-based screenwriter, journalist, editor, and all-around storyteller. He spends most of my time thinking about the big picture and obsessing over its details.